Passe um dia inteiro visitando o melhor de Budapeste em um carro particular ou em transporte público para uma experiência mais local. A Rua Váci e os pontos turísticos do Danúbio estão à sua disposição e, com a ajuda de um guia particular, você descobre detalhes que muitas vezes são perdidos por outros turistas. Mesmo com um cronograma apertado, você pode experimentar a capital húngara ao máximo, visitando o quanto quiser. and the lunch was an old tradition restaurant that our guide took us. This was an excellent tour and our guide and driver George was extremely knowledgeable about the history of Budapest but also more generally. His English was excellent and we learnt so much in this day tour and had very interesting and wide-ranging conversations. The lunch was tasty and authentic. Loved that we went to some places that were not on usual tours such as the stunning New York Cafe. Our tour guide George was knowledgeable and friendly. Well worth the extra money. Thanks - he did a great job. Very knowledgeable and really enjoyed where he took us for lunch. 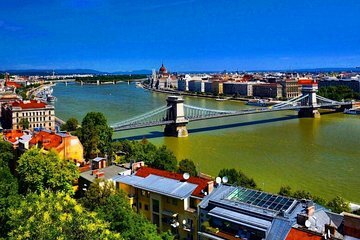 For your first full day in Budapest, this is how you should learn about a new city. George Molnar provided the best introduction to the capital. Top-notch! Tour guide was knowledgeable and energetic. The pride he felt for his country came trough as we toured all over Budapest. We had an EXCELLENT TIME!!!! Our private tour by car was outstanding! In just one day, we were able to take in the best of Budapest, thanks to our guide Jurák Zsolt and his driver. We were met in a timely manner in the lobby of our hotel. We were driven throughout the capital, with periods of walking in order to have a closer look. Among other things, we visited the Citadel, the Castle region and it's neighborhood, and Parliament. We enjoyed sharing a table with Zsolt for a traditional Hungarian lunch. We were so happy with our daylong tour that we engaged Zsolt for a half-day tour the following day. We visited Roman ruins on the outskirts of downtown Budpest, before proceeding to the picturesque Szentendre St Andrew's village. With it's old winding streets we were able to lose ourselves in a time from the past. We partook of local street food, and dined on pastries and coffee. We were able to choose marzipan from a local vendor, which we ate before leaving Hungary. We were then dropped at the airport with plenty of time for our 1:00 pm flight through London back to Chicago. We highly recommend our guide and his company, and will use them for future travel in the region. He was even able to give us advice on our upcoming cruise through Southeast Asia.